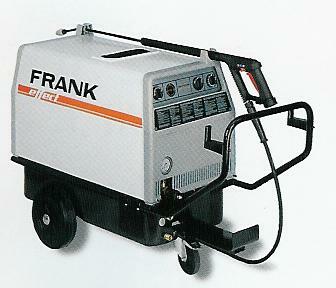 For a great variety of applications, Frank engineers have developed the high quality hot water high pressure cleaners. The entire life of these series is characterized by advanced technology according to international standards. Modern series techniques, high standard production technology and the FRANK quality assurance according to DIN ISO 9001:2000 mark these products. High quality components and fittings ensure trouble-free operation. Electronic remote control for 3 programs: "COLD", "HOT" and "HOT WITH ADDITIONAL DETERGENT"
Pressure switch control VARIO-STOP with cutoff delay system, high-pressure/steam stage. The configuration for special requirements with the capacity of up to max. 240 bar, max. 23 l/min. and control options of TCC, DMP and TS. Solid heating coil made of thick-walled precision steel, equipped with the FRANK oil automizer burner. The optimal flow of combustion gases ensure an environmentally clean combustion and high efficiency. Compact unit with integrated oil preheater and its own motor. The newly developed Dual-2 Phase technique offers these decisive advantages due to the remote controlled program selection of the operating stages low-pressure, pre-spraying and high pressure. The hot low-pressure spray jet, together with a highly concentrated detergent, achieves a maximum of washing efficiency. 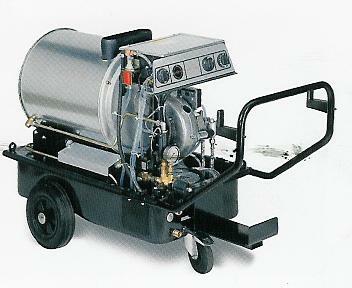 The optimally dissolved dirt particles are removed powerfully by the high pressure jet. There is no waste of unused cleaning detergent as is the case when applying the high-pressure jet together with detergents. Additional pre-spraying equipment is not necessary.